BUS routes in Southway and Ernesettle will be withdrawn due to dwindling customer numbers caused by unemployment, First Devon and Cornwall said. Marc Reddy, managing director of First Devon and Cornwall, said: "Over the past year, we've seen rising unemployment, and fewer people going out for shopping and leisure purposes. "These changes in the wider economy have had a knock-on effect on our business as fewer people have needed to travel. "Acknowledging these changes, we have adjusted our own networks to meet the current level of demand, reducing the frequency of some services where necessary, or taking some specific journeys out of the timetables where it is shown that very few people use them. "In two instances, we are withdrawing entire routes – this is because they have not performed in line with our initial expectations since their introduction last October. "To help people plan their journeys, we will make new timetable information available approximately two weeks before the changes come into force." Service 12 (City Centre – Chaddlewood via Marsh Mills and Plympton Ridgeway): The route of this service will change slightly from August 29. Buses will no longer stop in Mayflower Street from this date — instead, they will operate along the Viaduct and Royal Parade only. On Sundays, the frequency of buses will change slightly,(!) from one every half an hour to one every hour. Service 15 (City Centre – Estover / Mainstone via Crownhill and Derriford): The Monday to Saturday timetable of this service will be changed slightly from August 29, with adjustments made to improve the overall punctuality and reliability of the buses on the route, said a spokesman for First. All journeys on a Sunday will be removed from the timetable. This is Plymouth: Bus routes axed. TGP Dads Daily: What - no cream? 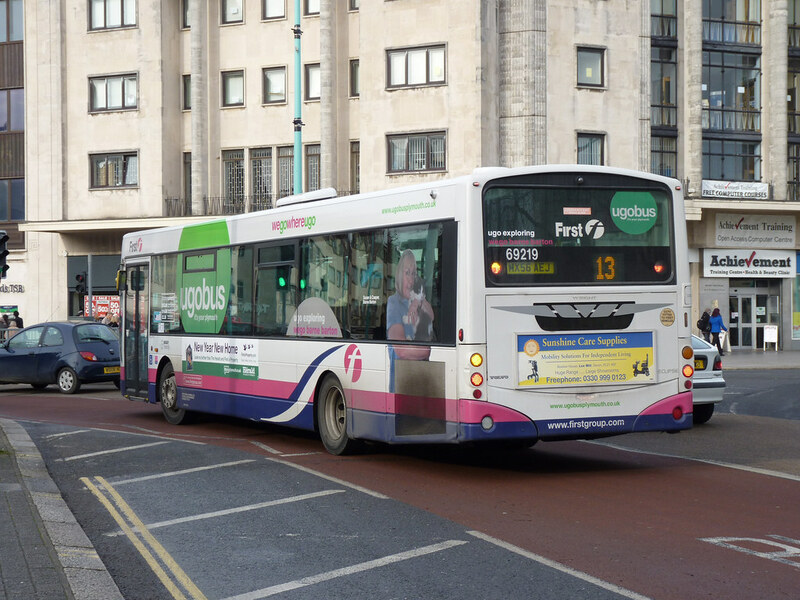 UGOBUS 15 is withdrawn on Sundays only but will retain a 20 minute frequency, Mon - Sat (FDC website). So hopefully it's just minor timetable change. I think this service does too well to be chopped anymore, a bit like UGOBUS 11 and 12. UGOBUS 12 - No evening service from the end of August. Why don't they just except they are making a loss running this service during the day as well. Anon - 10/08/10 11:52 - There never has ben an eveniong service on UGO 12 ??? Or UGO 13, 15,17, for that matter?? The reason being they make a nice profit in the daytime, 7am - 7pm but don't in the evening. I expect to see Go ahead do the same at Citybus soon for the same reason!!! I now have found out that UGOBUS 15 timetable will not change at all, Mon to Sat...It's just the Sunday service that will Ugo!